Both organizations and the SuperAdmin have the ability to edit and delete customer accounts. When a user is deleted, by default the app backends and the modules that the user created and managed are not deleted with the account. The modules and app backends belonging to the customer account are then moved to the next level up in the hierarchy shown below. When a customer account is deleted, the app backends and modules created in or by their account are then transferred to the managing entity, the organization. A visual representation of this is provided in the GIF below. When the SuperAdmin deletes an organization, the customers are moved to the "Default Organization" which is managed by the SuperAdmin. In the image below, we see what happens when an organization is deleted, the entities below the organization are then managed by the next managing entity. 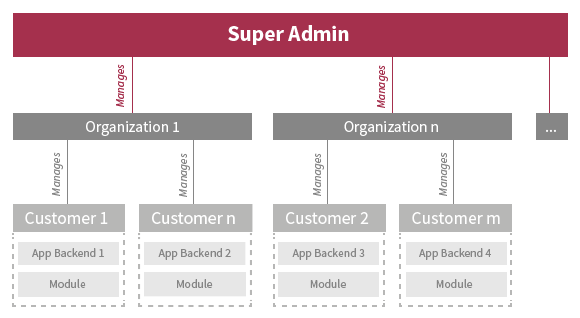 If both the organization and the customer are deleted, then the app backends and the modules are transferred to the SuperAdmin's Default Organization. When customers or a organizations are deleted with the force option, app backends and the modules that the user created and managed are deleted as well.